Governor Andrew M. Cuomo today announced that the Central Islip community will receive $10 million in funding as the Long Island winner of the third round of the Downtown Revitalization Initiative. As in the first two rounds of the DRI, one municipality from each of the state's 10 regional economic development regions is selected as a $10 million winner, marking another overall state goal to target $100 million in funding and investments to help communities boost their economies by transforming downtowns into vibrant neighborhoods where the next generation of New Yorkers will want to live, work and raise a family. "This investment will deliver a significant boost not only to Central Islip's growing downtown community, but to the entire Long Island economy," Governor Cuomo said. "I commend the community's leaders for developing projects that envision a stronger, more sustainable economy that will drive further economic development in and around Islip's downtown for generations to come." "The Downtown Revitalization Initiative is investing in communities to help grow their downtowns and pursue local projects as part of the Regional Economic Development Councils," said Lieutenant Governor Kathy Hochul. "This funding to revitalize Central Islip's diverse community will enhance transportation and revitalize the downtown area, attracting more visitors and businesses to Central Islip and boosting the local economy." Central Islip is a diverse economic and residential community with more than one-third of its population represented by ethnic minorities. As a result of this varied economy and increasing residential population, downtown Central Islip is on the verge of becoming a vibrant transit-oriented epicenter for the entire Islip community. DRI funds will be used to leverage the state's investment in the LIRR Third Track and Double Track projects by promoting transit development and downtown revitalization adjacent to the Central Islip rail station. With complete streets and traffic calming, this downtown will become a more inviting and enjoyable area. There are many sites along the downtown Carleton Avenue corridor that are ripe for redevelopment with the advent of sewers, including a potential public/private partnership that would be ideal for needed mixed-use development. Islip's third round DRI win entitles it to receive $10 million in state funding and investments to revitalize its downtown neighborhoods and generate new opportunities for long-term growth. Islip now joins Westbury and Hicksville, which were the Long Island region's winners in the first and second DRI rounds, respectively. This investment will deliver a significant boost not only to Central Islip's growing downtown community, but to the entire Long Island economy. Empire State Development President, CEO & Commissioner Howard Zemsky said, "The Downtown Revitalization Initiative will infuse Central Islip with the resources needed to create transformative community-based economic development - with critical investments in transit, infrastructure, quality of life and livability. The DRI represents tremendous opportunities for smart, strategic, sustainable growth in Central Islip that lay a strong foundation for generations of New Yorkers across the Long Island region." 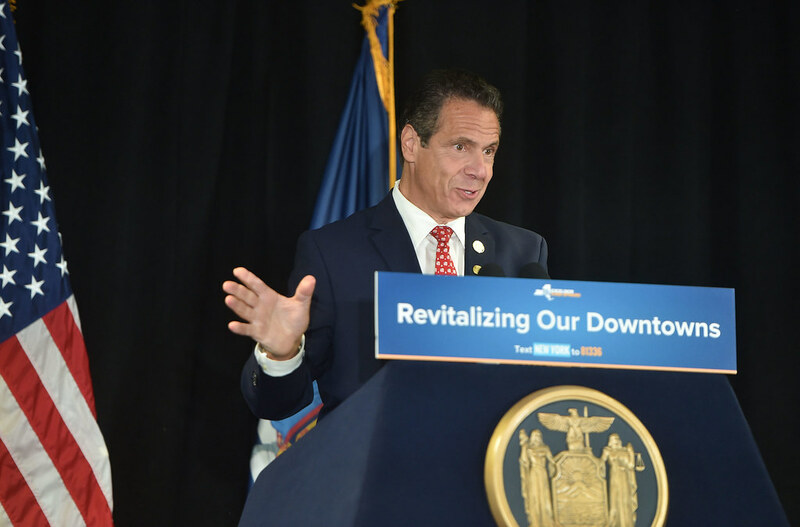 New York Secretary of State Rossana Rosado said, "Governor Cuomo's Downtown Revitalization Initiative continues to deliver hope and promise to communities across the state. Central Islip is a critical juncture for all of Long Island, and targeted, smart investments will help the downtown thrive and better serve its residents, businesses and visitors." New York State Homes and Community Renewal Commissioner RuthAnne Visnauskas said, "With this $10 million award, Central Islip will get the boost it needs to bring its housing, economic development, and revitalization goals to life. The Governor's innovative DRI initiative will help make this diverse, eclectic community an even more vibrant and attractive place to live and work." Assembly Member Phil Ramos said, "This Downtown Revitalization Initiative award will capitalize on the growth potential of Central Islip while spurring economic opportunity for local businesses and attracting entrepreneurs to our great region. I applaud Governor Cuomo's commitment to Long Island and thank him for this investment in the future of the Central Islip community." Long Island REDC Co-Chair Kevin Law said, "This investment is a win-win for Islip and all of Long Island. By focusing on attracting and retaining millennials and growing this region's workforce, Central Islip has secured a $10 million award through the Governor's Downtown Revitalization Initiative that will benefit the entire region. I thank Governor Cuomo for making this community's resurgence possible and look forward to more visitors in Central Islip's downtown for decades to come." Suffolk County Executive Steve Bellone said, "I'd like to thank Governor Cuomo for his leadership in recognizing Central Islip in awarding this grant for downtown revitalization efforts. An investment in this community is exactly what we need and will have long term economic effects that will impact every citizen. Creating a walkable downtown district with upgraded infrastructure and new developments for both residential and commercial buildings will create a vibrant, safe atmosphere for residents and visitors to enjoy." Suffolk County Legislator Monica Martinez said, "This much-deserved investment is exactly the kind of support Central Islip needs to raise the bar and develop the area's downtown for the next generation of New Yorkers. Under the Governor's leadership, Suffolk County is flourishing and Long Island is welcoming more visitors than ever before. With this investment, I look forward to a stronger, more viable Islip economy for years to come." Town of Islip Supervisor Angie M. Carpenter said, "I am grateful for the governor's confidence and investment in this community, and for recognizing all the great things Central Islip has to offer. By working together with local stakeholders, we will develop a plan that will affect the kind of positive change of which we can all be proud. Even through unthinkable adversity, the residents of Central Islip have proven themselves to be strong, resilient, and willing to work for the betterment of their community against all challenges. I look forward to implementing the $10 million award and moving projects forward to enhance our downtown for generations of families to enjoy." Islip will soon begin the process of developing a Strategic Investment Plan to revitalize its downtown with up to $300,000 in planning funds from the $10 million DRI grant. A Local Planning Committee made up of municipal representatives, community leaders, and other stakeholders will lead the effort, supported by a team of private sector experts and state planners. The Strategic Investment Plan for Central Islip will examine local assets and opportunities and identify economic development, transportation, housing, and community projects that align with the community's vision for downtown revitalization and that are poised for implementation. The Central Islip Strategic Investment Plan will guide the investment of DRI grant funds in revitalization projects that will advance the community's vision for its downtown and that can leverage and expand upon the state's $10 million investment. Plans for the DRI's third round will be complete in 2019.